"We’re excited to share our Ethos Pet Nutrition facility in Brownwood, Texas with you. Brownwood is a small town, which suits our small, family-owned company. And Ethos is where you can meet some of the dedicated people who make our pet foods. Take a quick Ethos Tour and see what’s cooking!" One by one, nearly 50 sales and marketing employees from the Canidae Natural Pet Food Company stood after eating a catered lunch in Brownwood, introduced themselves and told what city, state or territory they represent. Seattle. Portland. The Pacific Northwest. The Southeast. New Hampshire. Chicago. North California and Long Beach. Dallas. Connecticut. Georgia. Michigan. Indiana. Ontario. Eastern Canada. Cleveland. Arizona. New Orleans. Boston. Florida. Canidae employees market and sell the natural pet food that’s manufactured at Canidae’s plant in Brownwood — Ethos Pet Nutrition on Stephen F. Austin, which opened in 2012. The pet food is distributed from another Ethos facility, a shipping warehouse that had once been part of the long-closed Texas Feathers property on Morris Sheppard. These Canidae employees arrived in Brownwood Thursday afternoon in a tour bus that brought them, along with Canidae co-founders and co-owners John Gordon and Scott Whipple, to visit the Ethos facilities. The bus brought them from Austin, where they’d initially gathered for a series of meetings as part of a marketing trip organized by Canidae. Their first stop was the Morris Sheppard facility, where they ate lunch catered by Lemon’s Barbecue, walked through the warehouse that’s filled with Ethos product and watched a presentation from Ed Cooper, vice president of operations at the Ethos plant. Then they re-boarded the tour bus for a short drive to the Ethos plant, where Cooper, Whipple and Gordon escorted the marketing and sales employees through the facility. Brownwood has been an “awesome” location for the Ethos plant, Gordon said. “Scott and I visit pretty regularly,” Gordon said. 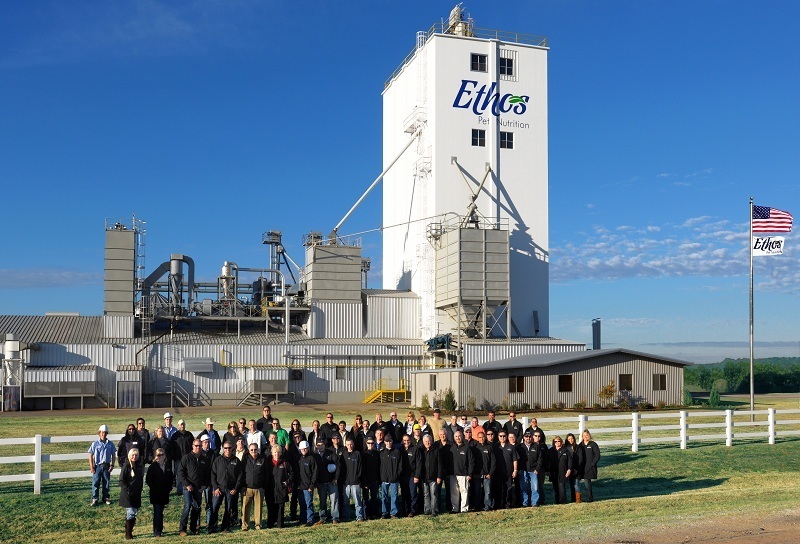 In his presentation to the sales and marketing representatives, Cooper gave a brief history of the Ethos plant, which began production in 2012 with a single formula and 80 tons of production a month. In January 2015, production consisted of 35 formulas and 2,100 tons a month. This month — April — might see a record of 2,400 tons produced, Cooper said in his presentation. And, Cooper said, an expansion is planned in which higher-volume machinery will be installed, increasing the maximum production capacity to 93,000 tons. “We want to be the ones that set the bar. We have succeeded in every area,” Cooper said. Ethos is also preparing for the export market and is working on obtaining registrations and inspections to enter 20-plus countries, Cooper said. “We have no choice but to expand,” Cooper said. In an April 2012 announcement, Canidae announced that it had purchased the former Bluebonnet Feed Facility on Stephen F. Austin, where it planned to locate the Ethos Pet Nutrition plant. In August 2012, Brownwood City Council members approved a $100,000 infrastructure incentive to pay for paving the property on Stephen F. Austin. A portion of the 9.7-acre property was not paved at the time, and the existing pavement was in poor condition. Last September, Ethos announced that a formal agreement had been signed to operate a shipping facility out of the old Texas Feathers warehouse. Ethos began renovating the warehouse, which had sat vacant and deteriorated for the previous several years. Locally, Canidae products are available at the Ag-Mart store in Brownwood.